جامعة پرنستون بالإنجليزية Princeton University ، هي جامعة أمريكية بحثية خاصة راقية، تقع في پرنستون، نيوجرزي الولايات المتحدة. وهي واحدة من ثماني جامعات في رابطة اللبلاب التي تضم أرقى جامعات في شمال شرق الولايات المتحدة. Many campus buildings have neo-Gothic archways and lanterns. Seen here is Blair Arch, the largest and most famous archway on campus. 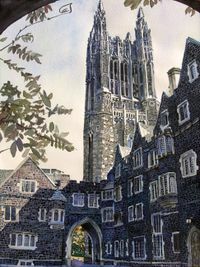 This watercolor shows Cleveland Tower as seen from just outside Procter Hall at the Old Graduate College in the noon autumn sun. جامعة برنستون هي ثاني أرقى جامعات الولايات المتحدة عموماً، بعد جامعة هارفرد. 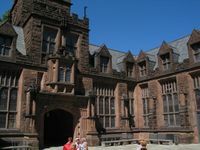 From 2001 to 2008, Princeton University was ranked first among national universities by U.S. News & World Report (USNWR). After one year at second place in 2009, Princeton returned to the number one spot in 2010, sharing that honor with Harvard University. It has been ranked eighth among world universities by Shanghai Jiao Tong University, fifth among top 50 for Natural Sciences by THES, and 9th among world universities by THES - QS World University Rankings. This last source also ranked the university third in North America, behind Harvard and Yale. In the "America's Best Colleges" rankings by Forbes in 2008, Princeton University was ranked first among all national colleges and universities. The Forbes ranking also takes into consideration national awards won by students and faculty, as well as number of alumni in the 2008 "Who's Who in America" register. Princeton Graduate School programs are also considered among the best in the United States and have been highly ranked. 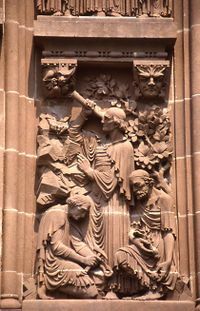 In the 2009 U.S. News & World Report "Graduate School Rankings", all fourteen of Princeton's doctoral programs evaluated were ranked in their respective top 20, 7 of them in the top 5, and 4 of them in the top spot (Mathematics, Economics, History, Political Science). 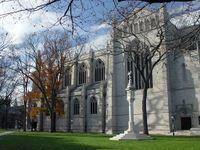 In Princeton Review's rankings of "softer" aspects of students' college experience, Princeton University was ranked first in "Students Happy with Financial Aid" and third in "Happiest Students", behind Clemson and Brown Universities. The university's individual academic departments have been highly-ranked in their respective fields. The Department of Psychology has been ranked fifth in the nation and its individual graduate programs have received high national rankings as well. The behavioral neuroscience program has been ranked sixth and the social psychology program has been ranked seventh. The Department of History is currently ranked second, relinquishing the top spot to Yale intermittently in the last decade. Princeton University also participates in the (NAICU)'s University and College Accountability Network (U-CAN). Princeton University has an IBM BlueGeneL supercomputer, called Orangena, which was ranked as the 89th fastest computer in the world in 2005 (LINPACK performance of 4713 compared to 12250 for other U. S. universities and 280600 for the top-ranked supercomputer, belonging to the U. S. Department of Energy). Princeton University was awarded a "B" for its sustainability initiatives in the College Sustainability Report Card 2009, published annually by the Sustainable Endowments Institute. ^ US News. America's Best Colleges. Retrieved on 2007-09-21. ^ "America's Best Colleges 2008". U.S. News & World Report. 2008. Retrieved 2008-01-12. ^ "America's Best Colleges 2009". U.S. News & World Report. 2009. Retrieved 2008-08-27. ^ "Academic Ranking of World Universities 2007". Institute of Higher Education, Shanghai Jiao Tong University. 2007. Retrieved 2007-04-15. ^ "World University Rankings". The Times Higher Educational Supplement. 2006. Retrieved 2007-11-09. ^  — A 2006 ranking from the THES - QS of the world’s research universities. ^ "Americas Best Colleges". Forbes. ^ "Top Research Universities Based on US News Data on PhD Programs". Retrieved 2009-07-06. ^ "Best Graduate Schools". U.S. News & World Report. 2009. Retrieved 2009-07-06. ^ "America's Best Graduate Schools 2008". U.S. News & World Report. 2008. Retrieved 2008-07-05. ^ "America's Best Graduate Schools 2009". U.S. News & World Report. 2008. Retrieved 2008-07-05. ^ "TOP500 Supercomputing Sites". Retrieved 2006-06-25.